From romantic rides and sightseeing tours to flight training, get the ultimate experience with MaxFlight premier helicopter services. MaxFlight Helicopter Services offers the best all around experience for new flyers and professionals alike. Our Day Time and Night Time Helicopter Tours is an experience the whole family can enjoy. Take in aerial views from all around the Four Corners of Central Florida; from Disney’s Celebration to Universal, Sea World and surrounding areas. Need training for your helicopter pilot’s license? Our pilot training school is one of the best programs for students just starting their career in the helicopter industry. 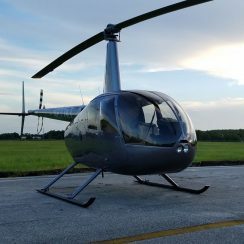 MaxFlight Helicopter Services mission is to provide professional and comprehensive flight training at an affordable cost to those seeking to fulfill the dream of becoming a helicopter pilot. Need a helicopter rental for a special event or task? Maxflight Helicopter Services has got you covered for everything from proposals, weddings, to music video shoots and charity events. Book your flight online or give us a call for all your helicopter needs. MaxFlight Helicopter Services is proud to offer Charter Services. Phenomenal company to work with! We used them for a private flight for an event and the level of service before, during and after the event was amazing! Dave & Austie were extremely professional throughout and would highly recommend working with this company! Look forward to seeing you guys again in the future for a ride/tour! Dave and Marly were amazing. Very fun experience. Highly recommend taking a tour with MaxFlight. FIRST HELICOPTER RIDE AND IT WAS GREAT! Our family took a couple of 30-min tours and really enjoyed the experience. The staff was friendly and very helpful. The pilot was skilled and put everyone at ease during the flights. Great experience and will come back again during our next visit to the Orlando area. This was so much fun. I was hesitant about going up but am so glad I did. The MaxFlight staff was very friendly and the flight, from takeoff to landing, was smooth. Next time, I may even try a longer flight. We took the 20 minute helicopter ride and the pilot was great. Even spoke with the owner the night before about what they had to offer and she was very nice. Highly recommended. Don’t Wait – Our Schedule Is Filling Fast! Contact Us to reserve a helicopter for your special event or Book Now to schedule a helicopter tour.